Sorry for the hyperbolic title, but I had to get your attention. I was all set to introduce you to Brad Ziegler, the Oakland A’s rookie reliever who just broke the record for most consecutive scoreless innings to start a career. Flying under the radar as a 28-year-old rookie for a team with bigger storylines (ZOMG Moneyball! ), Ziegler has posted 30 consecutive scoreless with practically no national attention. But as I was writing, I got scooped. Ziegler’s story has been featured as a ticker item on Yahoo, in the San Francisco Chronicle, Deadspin, Fangraphs, and even ESPN. I considered scrapping this article altogether after the incomparable Joe Posnanski told the Brad Ziegler story. Now that the secret is out, I have to resort to sensationalism vis a vis the title of this article to get you read. Also, I have PITCHf/x data I can use thanks to THT’s Josh Kalk and Mike Fast, so there’s some incentive for you to keep reading. Without rehashing too many details, Ziegler’s professional career has gone like this: drafted and then cut by the Phillies, pitched in an independent league, signed by A’s, fractured skull, converted from traditional overhand pitcher to submarine freakshow, fractured skull again, and finally called up to the majors. Oh, and he’s one of those lives-in-his-mother’s-basement bloggers. His traditional stat line (as of Friday morning) is impressive: 0.00 ERA, 30 IP, 14 K, 7 BB, 0 HR. Sure, the strikeout totals are low and the 2:1 K/BB ratio is pedestrian. But he’s stingy with the free passes, hasn’t allowed an extra-base hit, and has lapped all other Oakland relievers in WPA (2.08, the next highest is 0.80). The great thing about Ziegler, of course, is that he’s a submariner, and it’s at the heart of his succecss. Most obviously, there aren’t enough pitchers with that delivery for batters to get a handle on the pitch trajectory. But there’s another reason: groundballs. 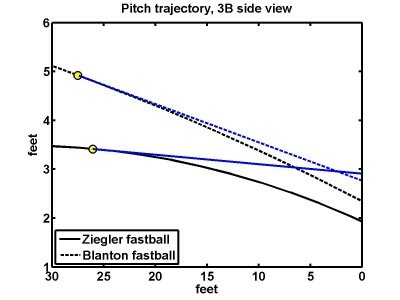 Let’s compare Ziegler’s fastball with a typical fastball from a run-of-the-mill righthander, say, erstwhile teammate Joe Blanton. The following picture is a view from the third base side of how the ball moves from the pitcher’s hand to the batter’s box. Notice that Blanton’s fastball is always losing altitude. That’s typical for basically all overhand pitchers. A hitter sees a fastball lose altitude all the time and learns how the ball drops as it travels toward him. But check out Ziegler’s fastball. It actually rises, since he releases it from such a low slot, reaches a peak somewhere around 33 feet from the batter’s box, and only then begins to drop. So while an overhand fastball is dropping from the moment it leaves the pitcher’s hand, the submarine fastball actually forces a batter’s eye to track it rising before watching it fall. Those yellow spots are where the ball is 225 milliseconds before it crosses the plate. According to The Physics of Baseball by Bob Adair, that’s how long it takes a batter to swing the bat: 50 milliseconds to process all the visual information—release point, trajectory, spin, etc.—25 milliseconds to send the appropriate signals to his muscles and finally 150 milliseconds actually swing the bat. To a large extent, a batter is “guessing” where the ball will be 225 milliseconds in the future, when the ball is still 25 or 30 feet away. Any information gleaned after that point won’t really help the batter since his body can’t respond quickly enough. This is a close up the last 30 feet of a pitch trajectory. 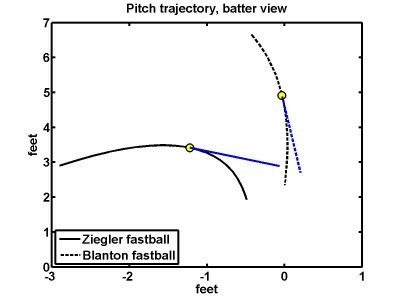 If the batter “extrapolates” the straight-line trajectory of the ball when it is 225 milliseconds away (in other words, if the batter assumes that the ball will travel in a straight line based on its instantaneous movement at that moment), the ball would move along the blue line. Obviously, the ball drops more than the straight-line trajectory, and this is the kind of vertical movement that a batter gets used to. In Blanton’s case, it’s a vertical difference of 4.3 inches. So, when the batter sees the ball coming toward him, and if he assumes it’s traveling on a straight line, he should “know” that it will actually come in 4.3 inches lower. Now look at Ziegler’s submarine fastball. The vertical difference between the straight-line trajectory and the actual trajectory is 11.5 inches, almost an entire foot! 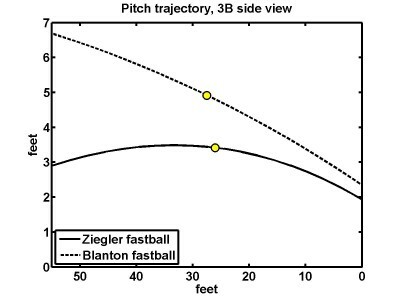 A batter used to adjusting his swing down by four or five inches for a Blanton fastball will swing right over the top of a Ziegler fastball. And that means groundballs. Lots of ’em. I have no idea if this is sustainable or not, but Ziegler is inducing grounders on about 70 percent of balls in play. That mark is the same for both his Triple-A time and his time with the A’s. And since Oakland has by far the best infield defense in the league, a lot of those groundballs are going for outs. Consider: 81 percent of Ziegler’s groundballs are converted into outs by the Oakland infield, right in line with Oakland’s .816 infield RZR. His .220 BABIP is a combination of luck, groundballs, and good defense. But if you feel bad for the hitters who have to face him, save your deepest sympathies for the right-handed hitters. The following video is what a Blanton fastball looks like from the batter’s perspective, slowed down about ten times. The bottom axis represents the horizontal movement (side to side) of the pitch and the side axis represents the vertical movement (up and down) of the pitch. At the point where the batter needs to make a decision, I’ve frozen the video for a few seconds. See if you can guess where the ball will end up. Imagine spending your professional career getting used to an overhand fastball and then being asked to hit Ziegler’s submarine sideshow. If you’re into pictures instead, this is what the overhand fastball and the submarine fastball look like from the batter’s perspective, with the straight-line trajectory at the point-of-decision in blue as before. For right-handed batters, an overhand fastball from a righty pitcher runs back in on their hands compared to its straight-line trajectory, and that’s something to which batters adapt. But Ziegler’s fastball runs way in, so righties are not only swinging over the top but they are getting hopelessly jammed. It’s easy to see why Ziegler has dominated right=handed hitters, both in Triple-A (76% groundballs, 82% coverted for outs) and the majors (79% groundballs, 81% converted for outs). None of this means that Ziegler isn’t riding a bit of a lucky streak. You can’t post a 0.00 ERA without some luck. He hasn’t given up a homer—duh, nobody has scored off of him—and his strand rate is 100%—double duh—neither of which will last. It would be great if he could get more swinging strikes. He’s benefited from a good team defense, although not disproportionately so compared to his teammates, and his line drive rate (14%) is on the low side. And of course, he’s only been through the league once. Only a handful of batters have seen him more than twice, so it remains to be seen if scouting reports or simple familiarity will reduce his ability to induce groundballs seemingly at will. No, Ziegler is not this good, but it’s not out of the question that—health willing—he approximates Bradford’s career and spends his peak as a valuable non-closer reliever.